Summer greetings, everyone, from Charlotte's # 1 Percy Jackson fan. I LOVE the Percy Jackson books. Do you hear me? I don't just like the Percy Jackson books; I LOVE them. LOVE THEM!! Got that? 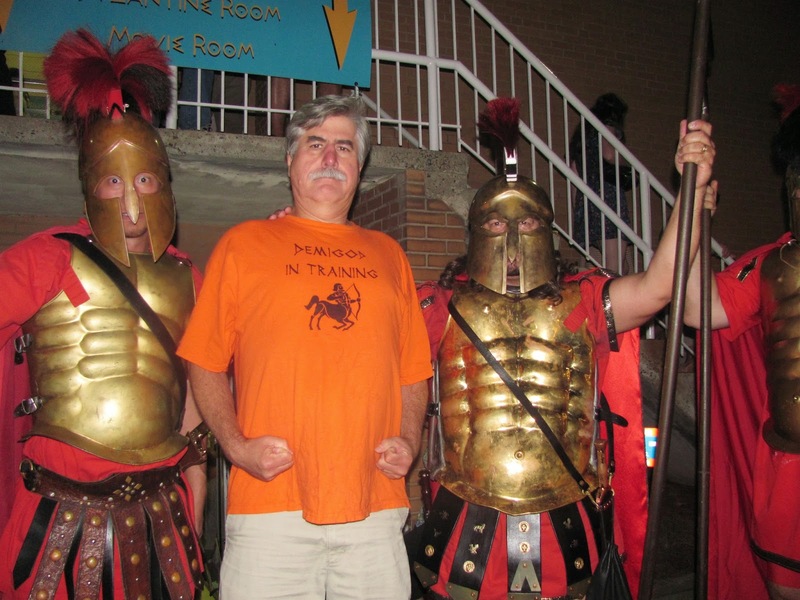 I'm such a fan that you see me here at last year's Greek festival in my Camp Half-Blood t-shirt--given to me by Mr. Riordan! So I was happy to finally get hold of a dvd copy of The Sea of Monsters, the second Percy Jackson movie. Yes, i know it came out last August, but I was busy that summer and missed it at the theatres. Anyway, I enjoyed it a whole lot and wanted to recoomend it to all you reader guys. In fact, I enjoyed it much, much more than The Lightning Thief movie, which seemed to be thrown together in a hurry and didn't catch the spirit of the PJ books. This one did--mostly. There was lots of action, of course, as well as plenty of monsters, fights with monsters, narrow escapes from bad guys--all the things that make a great GUY movie. But this one also had the wacky humor of the PJ books, which was missing from the first movie. Just watch the scenes with the "cab drivers" or the encounter with Hermes. Or the Confederate "zombies." And the effects are incredible! Witness the scenes inside Charybdis or the ride on the hippocampus. Of course, there were a few flaws--Clarice was in this one (she wasn't in The Lightning Thief movie) but she didn't look at all as she is described in the books and she wasn't nearly mean enough. Plus, if I remember correctly, there were big departures from the book near the end of the movie. All in all, however, this was a very fun movie and you'll get a kick out of it if you haven't already seen it. Or, even if you have, I bet you'll enjoy it the second time. The library system has plenty of copies, although it's relatively new, which makes it a Rental movie that costs $2.00 to check out--but I'm sure you have that money from your allowance and/or the work you do at home, right? The day after I saw the movie, I found a copy of The Titan's Curse graphic novel here at the Myers Park library (we didn't have a copy of the Sea of Monsters gn that day), so I checked it out and had the same reaction that I had to the Sea of Monsters movie. In other words, I liked it a bunch and found to be much, much better than The Lightning Thief graphic novel. That one was lame. The artwork wasn't that good--the characters looked like badly-made Play-Doh models--and the story was hard to follow. The artwork's ten times better in this one and the gn catches the feel of the book--mostly. The story can still be a little hard to follow and Atlas doesn't look nearly big and threatening enough. But, as with the movie, it was a lot of fun and you guys would definitely enjoy it. The Charlotte Mecklenburg library system has plenty of copies--one of which is still here at the Myers Park library. Come in, check it out and give me a high five! BTW, the fifth and final book in The Lost Hero series, The Blood of Olympus, is scheduled to come out on October 7. I've reserved a copy from the library already! Get your library cards out and you could do the same! Can't wait!!! And be sure to check out Myth and Mystery, Mr. Riordan's blog, to keep current with info about this terrific books. Now don't get me wrong. I didn't think his books were terrible; I just didn't think they were all that great. Let me give you a little background. I really liked the first DG book I read. It was Qwerty Stephens: Stuck in Time with Benjamin Franklin and I really liked it. In fact, I LOVED it! (see my review here) So I naturally thought all his books would be that good. And I was disappointed. I read Getting Air and it was OK. (see that review here) I read another, The Homework Machine, wasn't impressed at all and didn't even review it. I even tried a couple of the My Weird School books but couldn't get into them. "So what's up with this?" I wondered. "Why do all these guys rave about Dan Gutman? Am I missing something?" It got to the point that I thought about making a special Controversy Post about him and calling it The Great Dan Gutman Question. I've done two Controversy Posts before. 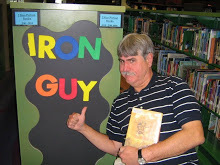 One was about Harry Potter (I'm not a big fan) and the other was about the Wimpy Kid books (I think Greg Heffley's a jerk) The Iron Guy is never afraid of expressing a reading opinion when it's not popular, but, in true MANLY MAN fashion, I decided to rethink my position before saying something I'd regret. Truly MANLY MEN always think before speaking!! Anyway, I checked out two My Weird School books and, wow, am I glad! These books are indeed terrific!! The first one I read was the first one in the series, Miss Daisy is Crazy! Here we are introduced to AJ, who hates school. But even he can read, write and add. So how come his teacher, Miss Daisy, can't do any of those things? A teacher who can't read? Write? Add? Hey, that might be cool after all--that teacher couldn't make you work! But AJ and his friends still hate school anyway--which gives them an idea. Maybe they could buy the school and turn it into a video arcade. Sounds great, huh? Do you think they can do it? You'll have to read to find out! The other one was Mr. Jack is a Maniac form the My Weirder School series.In this one, a guy rides up onto the school playground on a motorcycle! Turns out that he's new martial arts teacher who's going to teach the some self-defense moves, how to breathe and to expect the unexpected. So what does Mr. Jack do when the truly unexpected happens--like a bear walking into the gym!! What will Mr. Jack do? Check out this book to find out! These books are funny, funny and I need to say one more thing about them--they're funny!! The situations are wacky, the grownups are wacky and the kids are truly like second-grade kids everywhere--like being impatient with martial arts training. Except they come up with some wacky ideas too--like buying the school! I really enjoyed these books and I can see why guys everywhere like them. Not to mention they're fast, good and quick read. Enthusiastic readers, as well as those the grownups call reluctant readers, will enjoy these books. So count me in as a Dan Gutman fan! At least, for now. I like these books a lot but I'll have to read some of the other series, like the Baseball Card or Million Dollar books to see if I'm a DG fan or a My Weird School fan. Which means I'm going to need YOUR help! I want to read one of the books in the My Weirder School series. But which one should I get?? There are a lot of them out there--which one should it be?? I'll wait until I hear from you and the one that gets the most recommendations is the one I'll read. So write a title in the Comments section under this post and let me know!! And one more thing. I'd like to get on my Fourth of July soapbox for a moment. Without getting all political, I'd like to remind you that we live in a country in which we're free to read. That's not true in many places of the world. Here we can go to the library, bookstore, online book site and select whatever we'd like and read it without having to worry about who's going to break down our door for having that book. As I said, that's not the case everywhere. So, while you're having fun on the Fourth, remember to celebrate your independence!